StudioCloud’s workflow is designed to handle all different sizes of businesses and workflow needs. This specific tutorial provides a breakdown of the workflow for a single wedding photographer. All wedding photographers are unique and manage their workflow differently. As a wedding photographer you can choose which workflow options work best for you. For example, if you do not track leads you can skip that section and move on to the workflow methods you would like to implement. StudioCloud’s workflow is divided into multiple different categories. Those categories are lead tracking, booking a wedding, wedding tracking, invoicing, and order tracking. You can conceptually think of them as lead tracking is when you first encounter a prospective client, then the client books a wedding, what you need to do before and after the wedding, getting the order from a customer, and tracking that status of the order that needs to be delivered to the customer. Here is a visual breakdown of the typical way a customer flows through the workflow from initial encounter (lead tracking) to their wedding (wedding tracking) to their order being delivered to them (order tracking). In StudioCloud there are 3 types of customers: clients, prospective clients, and leads. A customer who signed a contract for a wedding. A customer who has an invoice for your services. A customer who has scheduled their wedding on your calendar. A customer who will be using your services. A potential customer who called you on the phone and is interested in more information about your services. A potential customer who emailed you and is interested in more information about your services. A potential customer who chatted with you and is interested in more information about your services. A potential customer who filled out a StudioCloud CloudForm on your website requesting information and was automatically added in as a lead to StudioCloud and automatically received an email with the information they requested. A list of potential clients that you received such as from a wedding conference or from a third party. A lead that postponed their wedding indefinitely. A lead that has decided not to use your services for their engagement but may consider your services for their wedding or vice versa. A lead that has decided not to use your services for the wedding but may consider your services for other types of photography sessions you may provide such as anniversary, newborns, family photo sessions, etc. A lead that you think would be worth marketing to in the future. Lead tracking is a process by which you track each lead to convert as many leads to paying customers as possible. The basic concept of lead tracking is it is similar to a white board with different stages. As you do each stage you move from left to right until the lead is a client, prospective client, or the lead is deleted. Below is an example of a whiteboard being used to track leads. StudioCloud mimics this concept using client pipelines. In the example above there are 3 client pipeline stages. The first stage is to email the potential client a welcome package. The second stage is to wait a few days and then call the potential client. If the client then agrees to the wedding then the final stage, in this example, is to email the client a contract for them to eSign. Lead tracking leads to an increased number of weddings because potential clients do not fall through the cracks. What is an example wedding lead tracking pipeline? Here is an example of a client pipeline for wedding photographers where the photographer is focused on talking to the customers over the phone and, after talking to the customer, sending them a contract. Pipeline Action: Email client a welcome email. Pipeline Action: Email client a “tried to call you” email. Below is an example of the above client pipeline being created in StudioCloud. In the example above a lead would be created in StudioCloud and the initial lead pipeline would be “Call Client (2 days after contact)”. This pipeline would send an email to the client with information such as a pricing sheet and the wedding photographers information sheet. The email would be sent to the client when the new lead is created. Below is an example of a new lead being created in StudioCloud where the client pipeline has the first client pipeline stage selected. After the new lead is created the wedding photographer would wait two days and then call the customer. The column “Time since lead created” displays how much time has passed since the lead was created. If the customer answered the phone then a conversation would occur and the photographer would do one of the following steps: Send the customer a contract, convert the customer to a prospective client, put the client on hold, archive the client, or delete the client. If the client did not answer the phone then the photographer would leave a voicemail and select the next pipeline stage which would be “Call Client (4 days after contact)”. This stage would automatically send a personalized email to the client telling them that they called and missed them. After 4 days the photographer would call again and do the same process as above. If the client didn’t answer the phone then the stage would be set to “Call Client (6 days after contact)”. If, after the next call, the client didn’t answer the photographer would then send a file email and wait a few days then either convert the client to a prospective client, put the client on hold, archive the client, or delete the client. Once the prospective client signs the contract then the wedding is scheduled and the prospective client becomes a paying client. The workflow then moves from lead tracking to wedding tracking. Another example of lead tracking pipeline where the objective is to meet with the client in person would be as follows. Have email contain a cloudforms book now button where they can book a consultation online. Note: The consultation session would use cloudalerts to automatically remind the customer of the session and to automatically send a personalized thank you after the consultation session. How do I setup Lead Tracking? The first step to setting up lead tracking is to enable the client pipeline. The third step is to customized the custom one field to be wedding date. Click here for a tutorial on how to customize the custom one field. How do I track the wedding date for leads? To track the wedding date for leads you would edit a custom field to be the wedding date. That way you would have a record of the wedding date but you would not have it on the calendar. That field would also be used so that a client could fill out a cloudform online and enter their wedding date. How do I view the leads based on the pipelines? There are two different ways to view the leads. Option 1 is similar to the whiteboard method where each lead is listed in a column. To use this option go to projects and click on the workflow tab followed by the client pipelines button. Then select the pipeline you want to view and it will display all of the leads in a column format similar to the whiteboard example above. You can double click on each lead to edit them and change the pipeline to move the lead to a different category. Click here for a tutorial on how to use pipelines views. Option 2 is to use the lead table view which is a table view of leads. 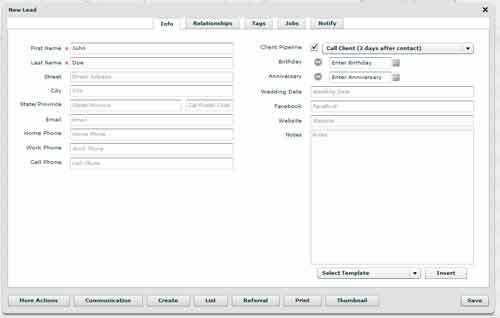 To use the lead table for lead tracking you would go to the leads and enable the column “client pipeline”, “Custom Field One”, and “Time since created” under the view column menu option. Then it would show you the status of all of the leads in one central location. How do I convert a lead to a client? To convert a lead to a client select the convert button at the bottom of the edit lead window. A lead will also automatically be converted to a client if they are added to an invoice. How do I collect a deposit from the client at the same time as when they esign the contract? If CloudForms are used to send to have the client eSign the contract a deposit can also be required at the same time. When the client eSigns the contract they will be directed to a payment page. Once they have pad for the contract an invoice will automatically be created for them with the payment included in that invoice. There are various options available regarding how a wedding can be booked. How do I schedule a wedding on StudioCloud's calendar? Wedding tracking is used to track the steps that need to be done before and after a wedding. Similar to lead tracking StudioCloud uses the concept of a whiteboard to track the status of a wedding. The whiteboard includes actions that need to be done before and after a wedding. Below is an example of a whiteboard being used to track weddings. StudioCloud mimics this concept using event pipelines. Each post it note indicates a wedding. StudioCloud Wording For Wedding Tracking? StudioCloud refers to wedding tracking as event tracking because it can be used to track weddings as well as any other type of session, event, or appointment. Event tracking leads to smooth and improved wedding experience where each client’s needs are addressed. A personalized email confirmation or text message would automatically be sent whenever a wedding was booked. This would remove the need to track that workflow item. A personalized email or text message would automatically be sent to the customer to remind them that a pre-wedding meeting needs to occur and that they would need to contact the studio to do that. A personalized thank you email or text message would be sent to the customer to thank them for the wedding. A personalized email or text message would be sent to the customer to remind them to book a sales session. An event pipeline is for anything that doesn’t involve an email or text message being sent at a specific time before or after the wedding to the customer. What is an example wedding tracking pipeline? Here is an example of a wedding tracking pipeline where the wedding and the reception are at the same time. For this example all of the items that could be done using CloudAlert have been moved to the next section below called “What is an example of how CloudAlert emails would be used?”. CloudAlerts would automatically email and/or text message the client to tell them to contact you to schedule the consultation. If desired CloudAlerts would automatically email and/or text message you to remind you to schedule a pre-wedding consultation. Note: The email could contain a cloudforms book now button where they can book the pre-wedding consultation online. CloudAlerts would automatically email and/or text message the client to tell them to contact you to schedule the sales session. If desired CloudAlerts would automatically email and/or text message you to remind you to schedule a sales session a specific time after the wedding. If desired CloudAlerts would automatically email and/or text message you to remind you to post the wedding a specific time after the wedding. What is an example of how CloudAlert emails would be used? Here is a breakdown of how CloudAlerts would be setup for wedding tracking. Send an email 3 weeks before wedding to schedule the pre-wedding consultation. Include a link to the cloudforms where they can book it. After the consultation is booked have CloudAlerts send an email 1 day before the pre-wedding consultation to remind them of their consultation. 2 hours before the consultation have CloudAlerts text message them to remind them of their pre-wedding consultation. 1 day after the consultation have CloudAlerts email them a personalized thank you email. 2 days before the wedding have CloudAlerts email them a personalized wedding reminder. 2 hours before the wedding have CloudAlerts text message them a personalized wedding reminder. 1 day after the wedding have CloudAlerts email them a personalized thank you email. 1 week after the wedding have CloudAlerts email them an email to schedule a sales session. Include a link to the cloudforms where they can book it. How do I setup Wedding Tracking? The first step to setting up wedding tracking is to enable the event pipeline. Click here for a tutorial on how to setup CloudAlerts for automatic email reminders. How do I use Wedding Tracking? When creating or editing an event select the wedding tracking pipeline for the event pipeline. 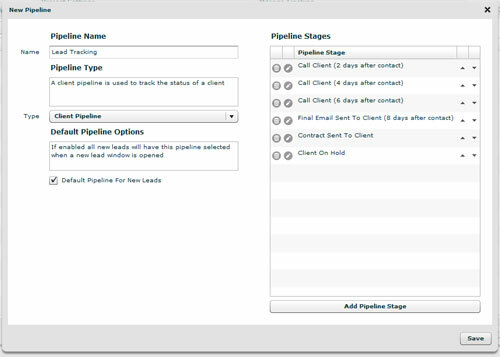 As each pipeline stage is completed select the next stage by editing the event and changing the pipeline stage. How do I view the weddings based on the pipelines? There are two different ways to view the weddings. Option 1 is similar to the whiteboard method where each wedding is listed in a column. To use this option go to projects and click on the workflow tab followed by the event pipelines button. Then select the pipeline you want to view and it will display all of the weddings in a column format similar to the whiteboard example above. You can double click on each wedding to edit it and change the pipeline to move the wedding to a different category. Click here for a tutorial on how to use pipelines views. Option 2 is to use the agenda view which is a column view of appointments. To use the agenda for wedding tracking you would go to the agenda and enable the column “event pipeline” under the view column menu option. Then it would show you the status of all of the weddings in one central location. If you have the EmployeeBoost you could filter the events to only show weddings by setting up a wedding calendar filter. How do I create products, services, packages, and price lists. How do I do payment plans? Order tracking is the final step in workflow. Order tracking involves tracking the status of an invoice once the invoice is completed. Similar to lead tracking and wedding tracking this option uses the whiteboard concept to manage the workflow. Below is an example of a whiteboard being used to track orders. StudioCloud mimics this concept using invoice pipelines. Each post it note indicates an order. What is an example invoice tracking pipeline? Here is an example of an invoice tracking pipeline for tracking the entire status of the order. This pipeline stage includes any touchup that needs to be done to the photos. Pipeline Action: Send an email and/or text message to the client when the order ships. How do I setup Order Tracking? The first step to setting up order tracking is to enable the invoice pipeline.